The Daily Digress: When will I learn? I was enjoying a few moments of peace this morning, in between changing The Tank's diapers. Happy Diarrhea Day to Me! Just for today, I'm thankful he's not potty-trained. So, he was watching a movie in the kitchen - or so I thought - and I heard him moving around. No big deal, because the movie was Billy Jonas and the Tank likes to sing along and dance. I heard him say something, but I was doing really well playing Scramble on Facebook, so I ignored it. I heard it several times, each time more enthusiastic than the last. In between the outbursts, I heard a small sound, like crktt. He was so happy about it. I couldn't do anything but hug him. Score another one for Wellbutrin! Eggs are very hard to clean up with paper towels. Now you know. Last week, life was perfect. My whole day revolved around beverages and hanging out. These are some beverages I enjoyed. 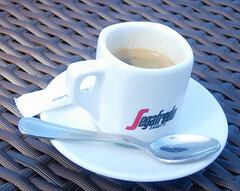 First, imagine the taste of rich, warm espresso, sipped by the pool from one of these fancy Italian-y looking cups. Also poolside, Coca Light quenched my afternoon thirst. 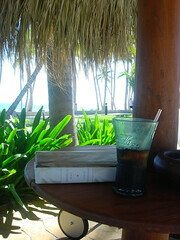 I really, really miss reading under these straw umbrella thingies over the lounge chairs. American Wife, by the way, was a great vacation read. I'm finished, if anyone wants to borrow it*. Why does Coca Light taste so much better than Diet Coke? Anyone? Maybe it's atmosphere. 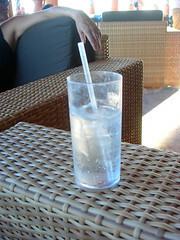 This last drink was my favorite, Malibu and club soda. Light on the alcohol, so you can have two! This vacation treat is ideal for sipping while playing "European or American?" Speaking of "European or American? ", my theory about Crocs and Speedos as unquestionable confirmations of nationality was incorrect. This guy proved it wrong, as he sports both Crocs and a Speedo. Speaking of pants vs. no pants, both my husband and his brother managed to get locked out of their rooms without pants. I don't really understand how that happens. I never go outside without something covering my bottom. That is one of the rules I live by. Both of them attempted to re-enter via their respective balconies. Our room was on the first floor. My brother-in-law's was on the second floor. 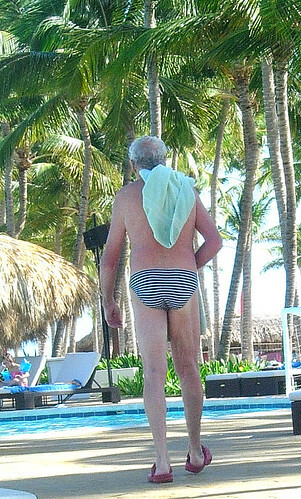 Please try not to picture him scaling a yellow stucco building at Club Med Punta Cana with no pants. Ha, ha! Try to get that image out of your head now! I'm thankful I didn't see it. * I will not be including it at my next Anti-Book Club if you were counting on it. you know i thought the top photo was diarrhea all over the floor. Thanks for that. and for the speedo photo. nightmares tonight. I think their Coca Light is more equivalent to our Coke Zero rather than Diet Coke. At least in taste. Ewwww...now I see diarrhea every time I look at it...awesome. and let's see if it ever gets here. Pde. Felipe Calderon has promised that MexPost will start working again so I'm going to start trying them out.